Often overshadowed by fellow Russian originated broker Alpari, FXOpen has also been steadily growing its business over the last few years. Attributing to their success among retail traders has been tournament style trading competitions to attract new customers and showcase top performers. As a result, by the end of 2013, FXOpen was among the top 15 brokers in the world in terms of retail volumes in Forex Magnates’ Quarterly FX Industry Report. In addition to its retail facing division, FXOpen has been active in the B2B sector, providing white label partnerships as well as liquidity arrangements to other brokers. When it was announced by MetaQuotes that they would be launching MetaTrader 4 to MetaTrader 4 liquidity connections, FXOpen was among firms that stated to Forex Magnates that they were planning on being active providers of FX and CFD pricing using the new initiative. The MT4 to MT4 connectivity would allow any broker with a MetaTrader 4 server to connect to another broker, and use them to automatically hedge client orders, and initiate straight-through processing (STP). Following expansion of its B2B business, FXOpen has launched a liquidity provider (LP) unit. The LP division, which FXOpen began to publicly market in the recently concluded iFX EXPO in Macau, will provide ECN connectivity to brokers, professional traders and asset managers. According to FXOpen, the ECN will stream pricing from its network of primary bank liquidity providers as well as KCG Hotspot and LMAX, using technology from Integral and Currenex. In addition, according to FXOpen, the ECN will be accessible by high frequency traders via the presence of non-bank market makers that will be providing pricing on the system. Also arriving with the traditional FX and CFD liquidity from the new unit is the launch of bitcoin trading. FXOpen has been in the space for some time as they have been providing technology solutions to bitcoin exchange, BTC-e, for their MT4 offering. With the arrangement, BTC-e began to offer its clients access to trading bitcoins and other digital currencies on their exchange using the MetaTrader 4 platform interface. Combining their current relationship with BTC-e as well as their LP initiative, FXOpen has begun to offer brokers direct bitcoin liquidity. The available bitcoin liquidity to brokers will be based on matching trades with BTC-e’s order book, as well as matching internal FXOpen trades. With the new liquidity, brokers will be able to create CFDs of the digital currency for trading to their clients, as well as be able to hedge risk by buying bitcoins directly from FXopen. Although several broker technology providers announced the launch of stable bitcoin price feeds for the MT4 platform, many brokers have related to Forex Magnates that how to hedge client risk of digital currencies is a more difficult endeavor (more on the difficulties of CFDs and bitcoins for brokers). In addition to the B2B offering, Peganov mentioned that FXOpen is planning on launching bitcoin trading for retail clients in the next one to two weeks with customers opening accounts directly with the broker. He added that FXOpen also currently provides both its B2B and retail customers the ability to fund accounts in bitcoins, namecoins and litecoins, with trading arriving to all three of digital currencies (see image). 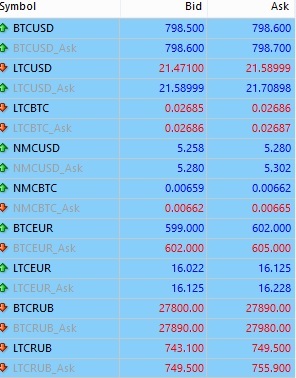 Looking ahead, it will be interesting to see what the uptake of the bitcoin liquidity among brokers is. Currently, Forex Magnates has heard mixed reviews among forex and binary options brokers that have launched bitcoin trading, with some firms seeing very little actual trading taking place despite active interest from their clients before they launched it . However, the arrival of a regulated source of bitcoin liquidity, as well as pricing in litecoins and namecoins, would be expected to offer greater choices in how to offer CFDs of the product which could boost volumes. 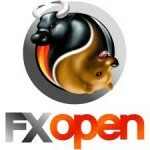 so is fxopen ecn offering these products; nz/au/uk? also, will you be accepting deposits/withdrawals via btc? will you offer an exchange service or a "physical" delivery service of btc or other dc's, similar to what Oanda and LMax do now with fiat currencies. BTC products are available via NZ Company at the moment, AU and UK examining legal framework. Deposits/Withdrawals. Yes, we accept already. Exchange services. Yes, it is available via MyFXOpen. The advertise with “streaming limit order liquidity” and “price/time priority execution. That can not possibly be the case if the diagram they have on this website is what they are doing. It may be the case for the liquidity their banks stream directly to their platform, but certainly not for the liquidity they aggregate from ECNs, since they have no control over the execution process for these.